I had to make a run to the recycling center today and decided to stop by Wallace Center (the building on Auburn University’s campus that houses the Industrial and Graphic Design programs). I thought the place might be deserted on a Saturday during Christmas break. I was right and got some very cool photos with my Pentax K10D and Pentax-A 50mm f/1.7 SMC lens. Lucky thing I always have my camera handy! The photo above was shot hand-held at ISO 400, f/4.0 at 1/25 second. The K10D’s in-body IS helped ensure a sharp shot. I later processed the image as black and white in Adobe Lightroom. When I first entered the building I came in just on the other side of the doors at the end of this hall and headed up stairs. The motion activated light switches automatically turned on the lights at the end of the hall where I came in. Later, I came down another set of stairs at the opposite end of the building and entered this hallway on my way out. The automatic lights took a second to react to my presence before flooding the entire corridor in fluorescent light. 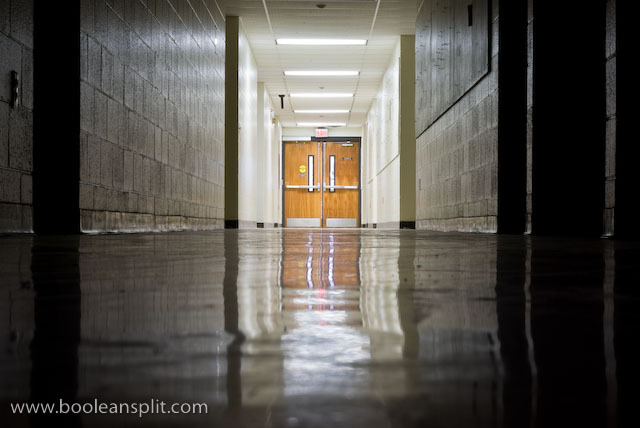 I really liked the way the light at the end of the hall played off the walls and polished floor when half the lights were off, so I found the switch and turned off the lights at this end of the hallway before taking this shot. 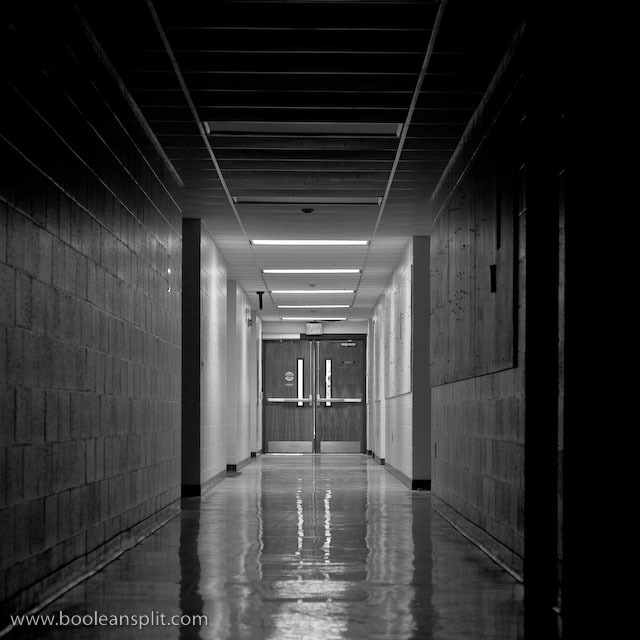 After taking the black and white picture of the hallway, I decided to try a long exposure deep focus shot. Having not brought my tripod I had to improvise and simply set my camera on the floor. I got this shot by simply selecting f/22 and ISO 100 in Aperture Priority mode and the camera dialed in 10 seconds for the exposure. I used the 2 second self timer to release the shutter without touching the camera. All I did in Lightroom was tweak the white balance and add a little sharpening. These push pins adorn the gallery wall used by the Graphic Design program. Normally they are holding up student artwork and photography. Now they patiently await next semester. Hand-held, ISO 400, f/2.8, at 1/15 second. I tried f/1.7 but couldn’t get the focus on the push pin in the dim light of the hallway. 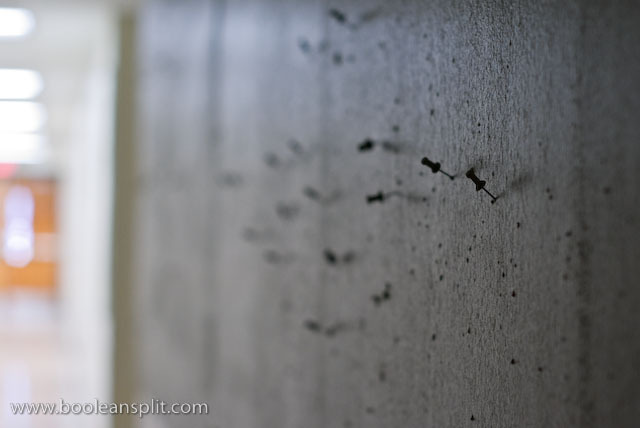 Plus, I found the slightly greater DOF of f/2.8 did a better job of keeping the push pins in the distance recognizable. 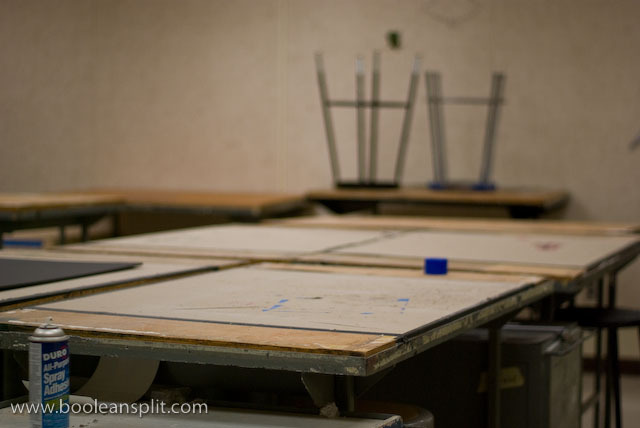 This is the studio where I have spent the last 3 1/2 months. It’s a lot cleaner and quieter than it has been. I love the feeling of the vignetting this lens produces wide open. Hand-held, ISO 400, f/1.7, at 1/500 second. One of the 3rd year studios. 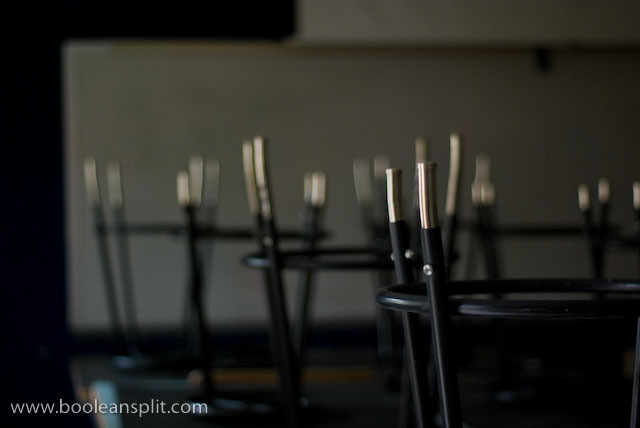 All the stools where upside down on the desks and the light filtering in through the windows facing the hallway was mesmerizing. I shot this hand-held at ISO 400, f/1.7 and 1/8 second. 1/8 second is starting to push the envelope of what the built-in IS can do on the Pentax. I could have bumped up the ISO but instead I just braced myself up against a wall and controlled my breathing. It took a few tries but I got a number of clear shots with some wonderful bokeh.